Can a Healthy Diet Prevent Neck Pain? When it comes to treating pain, there are often many options before surgery. Here is some information on the important role your diet plays in neck pain relief. 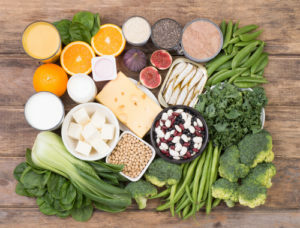 The right foods can support the health of the bones, nerves, and connective tissues in your neck. An anti-inflammatory diet may help you avoid diseases like arthritis that can cause neck pain. Your neck is made up of seven bones called vertebrae that are separated by shock-absorbing cushions called disks. This flexible, gently curved column that holds up your head requires an interconnected support system of muscles, tendons, and nerves. It’s no wonder that injury, stress, and the wear and tear of years of activity can result in neck pain. There is no miracle food or nutrient that can provide neck pain relief, but anything you can do to support the health of the bones, nerves, and connective tissues that make up your neck can help. Researchers who study bone and joint health are learning more about the important role that diet plays in diseases like arthritis and in the process of inflammation. Nature has provided us with wonderful nutrients that promote good skeletal health; science also has contributed. These acids, found in cold-water fish such as salmon, mackerel, and sardines, can actually lower inflammatory chemicals in your body. If you don’t like to eat fish, you can take a fish oil supplement. You can also get some omega-3 from flax seeds, walnuts, and leafy green vegetables. You should try to have five servings of vegetables every day, and two to four servings of fruit. These foods are high in fiber and anti-inflammatory antioxidants. Recent studies have shown that fiber, which you can get from beans and grains as well as fruits and vegetables, lowers an indicator of inflammation in your blood called C-reactive protein. One study found that men who ate more fruits and vegetables could lower their C-reactive protein levels by one-third. Since neck pain can be caused by wear and tear of the vertebrae in your neck, it makes sense to keep your bones as healthy as possible, so calcium should be an important part of your nutrition plan. You will also need vitamin D to absorb the calcium you take in. Recommendations for an average adult are 1,000 to 1,500 milligrams of calcium and 400 to 800 IU of vitamin D each day. Many foods are fortified with calcium and vitamin D. Read the nutrition facts panel on your food labels. Doctors are increasingly recognizing the value of magnesium in skeletal health. If you are not getting enough magnesium, you may be more susceptible to neck pain, muscle tension, and muscle soreness. Magnesium is an essential mineral needed for contraction and relaxation of your muscles. It can be found in fruits and vegetables, nuts, beans, soy, and whole grains. The recommended daily requirement for magnesium for an is about 400 mg for adult males and 320 mg for adult females. Not getting enough fluids into your body can be a cause of muscle pain. When the body is dehydrated (a condition in which you are losing more water than you are taking in) it can result in an imbalance of the electrolytes and minerals that you need for normal muscle and nerve function. An excellent way to help attain neck pain relief is by reducing the types of foods that cause inflammation. Arachidonic acid and other saturated fats found in meat and dairy products are building blocks for your body’s inflammatory response. So, to reduce inflammation, you’ll want to reduce your consumption of meats and high-fat dairy products like butter and cream. Most processed foods are also high in these fats. Instead of these pro-inflammatory foods, you can substitute other sources of proteins such as fish, nuts and beans. You should also know that alcohol and smoking can affect bone health. Alcohol can cause you to lose calcium and magnesium in your urine, and cigarette smoke is damaging to your bones. Doctors are increasingly recognizing the importance of nutrition in maintaining skeletal health. If you have been suffering with neck pain, get going with a diet that fights inflammation and promotes healthy bones and muscles. Original article published on everydayhealth.